Seriously? Did I read this correctly? A boy sees two dogs getting it on when he is 15, kills them, and hangs them from a tree. 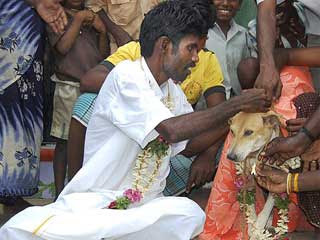 He believes he has the dog curse, so in order to “atone” for his sins he marries a dog. No joke, the picture does not lie. This dog was dressed in ceremonial wedding apparel. There are tons of issues within the context of this news, who owns the dog, how does this man think a marriage will work with a dog, will they sleep together, children, the list goes on and on. The most outstanding and ultimately most important issue raised in this article is the use of the word atone. This man thinks that getting married to this dog will atone (which means to cover) his sin. Everyone has this deep feeling of the need for forgiveness when they sin. The word sin is not used that much these days, but people feel like they need some kind of justification or be told they are okay when they mess up. The problem is that people don’t realize what atonement really looks like and who they can get it from. God offered Israel temporary atonement through the temple worship and sacrificial system (Leviticus). They could never be completely perfect within this Law so God set it up in a way where they were looking for a Messiah. Jesus came as the ultimate sacrifice, the perfect lamb. By Jesus’ blood those who believe in Him are counted as righteous, their sins are atoned for (Romans 5). We can never do enough community service projects, buy enough children’s miracle network balloons, give enough to charities, or do any religious activities that will grant us forgiveness. It is only by having faith in Jesus Christ we can truly have our sins atoned for. God is completely just and cannot accept sinful people, which all humans are, so Jesus is the only way we can be seen or accept by God. Faith in Christ is the only atonement we can find. Stop depending on marrying dogs, praying facing a certain direction at a certain time, being reincarnated, or any other religious activity to forgive you, to atone for your sins, only Jesus can offer this atonement. May you seek Him and may your sins be truly atoned for by faith in Him.